This morning my honey and I went out on one of our Saturday morning excursions, choosing this time, an old favorite, Seaport Village. It’s location down on the embarcadero in San Diego is hard to beat. After walking for a while, we decided a warm drink and perhaps a little treat were in order. 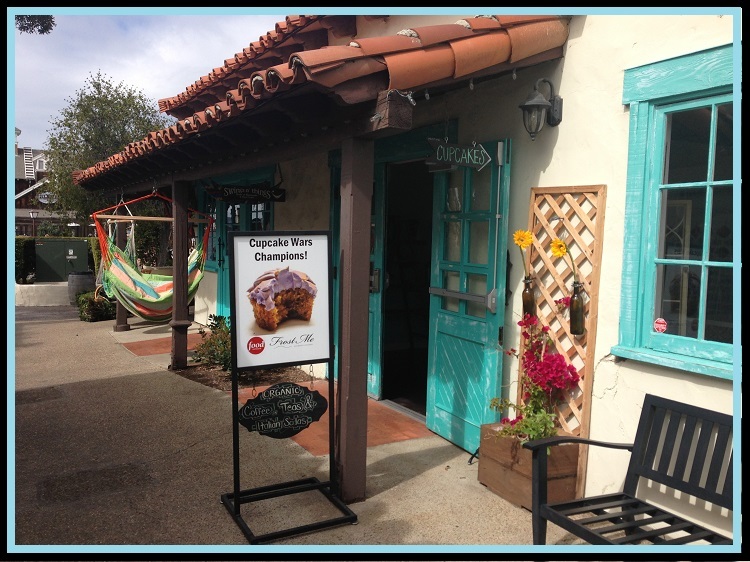 As luck would have it, we happened upon a cute little cupcake shop called “Frost Me” and ventured inside. Not only did we encounter delicious food, but also a kindred design spirit and someone you may have seen on national TV. The smell of good coffee and fresh baked cupcakes is hard to beat, but I have to be honest with you, I was almost more enamored with the creative DIY and repurposed furniture in the Frost Me shop. The first thing that caught my attention were the tin tiles adorning the front of the counter. Next, my eyes landed on the cutest shelving unit ever. What a creative use of ladders to get a unique look and also a great repurposed item! I struck up a conversation owner Audrey Hermes and told her how adorable her shop was and that I just might have to steal her ladder idea sometime. She then pointed out this cute little table she had rescued from the Salvation Army, given a little love to, and now it sits proudly in the front of her store. When I see things like this, it makes my heart happy. There are so many items out there with character just waiting for someone to take them home and love them. You get the bonus of saving some money and gaining a unique furniture piece full of personality. We got our goodies, which were delish! If you love cupcakes and live in the San Diego area, I highly recommend visiting Frost Me—you’ll come for the cupcakes and stay for the cute décor. The cuteness continues in the outside seating area where Audrey used vintage bottles as vases mounted to simple trellis frames. These are inexpensive but really add charm, color, and texture to the outside atmosphere. 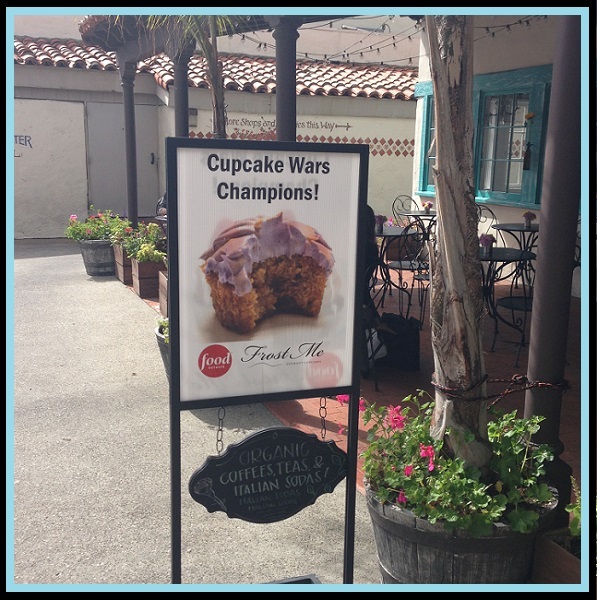 If you’re out and about or come to visit San Diego, be sure to drop by one of the nicest little shops ever and get some yummy cupcakes from a culinary celebrity—Audrey and her boyfriend were runners up (“Big Time Rush” episode) and then winners (“Breeders Cup” episode) of Food Network’s Cupcake Wars. Thanks, Audrey, for the yummy food, too-cute atmosphere, and great conversation. Now, what you do next to love where you live?